The Tisbury school board and selectmen work together to plan next steps for the Tisbury School. 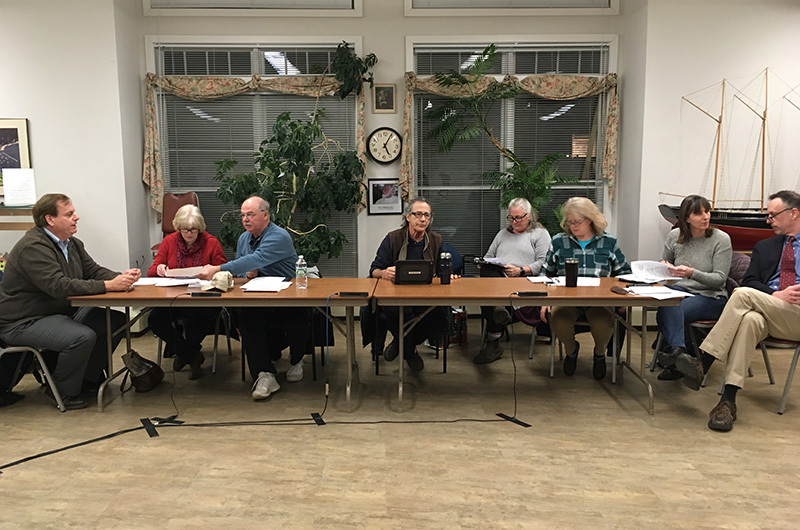 At their joint meeting Monday evening, the Tisbury School committee and selectmen approved more than $900,000 in three co-sponsored warrant articles in a continued process to move forward after last year’s proposed plan to build a new school was voted down at town meeting. With the aim of giving some direction to the project, the two committees voted to include language in one warrant article specifying that they plan to do a renovation and addition on the existing school rather than build a new school. Other warrant articles would fund more urgent improvements to the school. “Let’s go for it. Let’s start planning a renovation/addition right away,” said selectman Jim Rogers. School committee member Janet Packer agreed. “I think we definitely need more room and we definitely need that building to be repaired... I think it’s not such a bad idea to actually move the ball and start focusing on that,” she said. ­­— Up to $400,000 for design work for a renovation/addition to the school including some $70,000 leftover from the previous project. — Up to $410,000 for mold and mildew testing and remediation (co-sponsored with the town facilities department). — Up to $122,000 for repairs and replacements including the gym wall and roof, buckling floors in six classrooms, and the school entrance (co-sponsored with the town facilities department). The two bodies acknowledged the difficult process and potential variables of spending funds for short-term repairs when a larger renovation/addition project is looming. School committee chairman Amy Houghton said the amounts in the warrant articles could be reduced at town meeting if plans for larger improvements solidify. Town administrator Jay Grande noted that the total for mold remediation was based on several variables, and was likely to change. School principal John Custer asked the two boards whether there was any interest in applying for funding support from the Massachusetts School Building Authority. The school committee and selectmen were unenthusiastic about another application to the state for support. Tristan Israel, chairman of the board of selectmen, said he worried the school would have to apply several more times before being accepted into the program again. “I don’t know if we can afford to wait that long,” Mr. Israel said. Is someone going to fix those plants? Renovations such as roof that leaks causing mold and Windows that leak?And a out dated heating system and things that should have been kept up on that building as general maintenance so its now called renovation not general maintenance ,we need to get all that done now then go for additional building for what is needed.Three cheers to all on getting ball moving on our historical school saved. The problem with this view is that you assume the space will be exactly the same. Why replace windows that may move? Why replace HVAC without a plan for where everything will eventually end up. That is why the OPM and architect are part of the process so that we only do this once. Please read the article. Tisbury needs a renovation AND addition. In order to spend our money wisely we should all want to do this this only once with an actual comprehensive plan in place and not just some bolt on addition later. Yes, It needs windows, yes it needs a roof but think big picture otherwise we end up spending more in the long run. Kudos to both committees for getting us forward! How dd this happen?? Who's is in charge of the maintence of the school?? Glad to see we are getting the renovaions underway. We sure don't need a another fiasco like the Fire Staion!!!! The Tisbury school has announced its fourth quarter honor roll for the 2017-2018 school year.